I want to share a very special card with you. I had an idea to pair The Tiny Star Background and the Greates Gift somewhere on the back of my head for very long, but finally I had an opportunity to implement it. It feels good to start preparing this early for Christmas. As the holidays approach it will be harder to find time for hand-made gifts. I started with applying distress inks on the white eggshell watercolor paper rectangle. Then I stamped the Greatest Gift central image and colored the hill and the stamped image with a black pen. 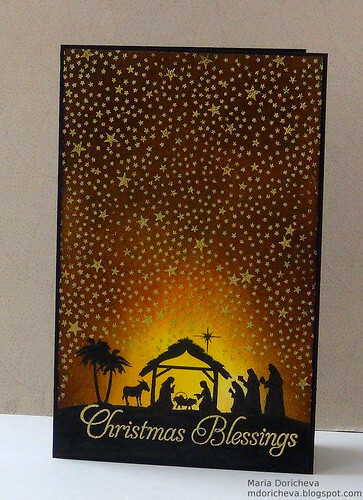 After I masked the nativity I stamped the Tiny star background in embossing ink and heat embossed in gold. It is best to do the embossing part last. I rubbed on more distress inks and heat embossed the sentiment in gold. I would like to enter these two tag cards into the Hero Arts Holiday challenge, the category Mad About Metallics. One of the conditions for the challenge is that the card has to have a tag. UPD: I have used 3 distress inks: Mustard Seed, Rusty Hinge and Walnut Stain. UPD2: My card was a winner! Please check Hero Arts blog. Maria, this is breathtaking! What a beautiful card! lovely! can you tell me which distress ink colors you used? this is simply beautiful!! Thank you, ladies, for your uplifting comments. I have used 3 distress inks: Mustard Seed, Rusty Hinge and Walnut Stain. Маша! Это так круто!!! Очень нравится!!! Just saw your awesome card from HA challenge - your background distressing is simply amazing and love how you paired off the two stamps together! I hope you win Stunning card I love the sponging. Congratulations on the HA win!! Congratulations on your win at Hero Arts Blog! Well deserved, its a super beautiful card! Congratulations on your well deserved win at Hero Arts! Your card is absolutely, positively STUNNING!!! Such a luminous card, Maria - just love how you combined these two stamps! Congrats on your win at Hero Arts! Thank you so much for sharing such a beautiful card. I love the distress ink choices. Congratulations once again, Maria - it's a star! Pun intended!